Is All Mobile Technology in the Car Dangerous? Luxury carmaker BMW is launching a nationwide campaign to build awareness about the hazards associated with driver distraction, and especially the dangers of texting while behind the wheel. You're likely to see BMW's public-awareness commercial or online and print ads sometime this year. The TV spot is particularly frightening, as it effectively shows how children are all too often innocent victims of careless and negligent drivers who text while driving. 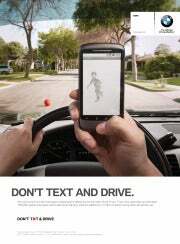 BMW's campaign follows a meeting held in December between BMW of North America CEO Jim O'Donnell and U.S. Transportation Secretary Ray LaHood, who has been consulting with automotive representatives to discuss initiatives carmakers can take to help prevent distracted driving. O'Donnell has also applauded BMW's safety campaign. "With this initiative, launched just in time for the summer driving season, BMW has really stepped up to the plate," O'Donnell wrote on this blog earlier this month. But what is left unsaid in the media campaign is that along with most of the world's carmakers, BMW wants to make mobile tech available to drivers. Automakers also generally contend that hands-free applications are relatively safe. The consensus is that using your hands to write and send a text message is dangerous, but a hands-free solution is okay. "We proactively offer technology in a safe way and one example of how we do that is by offering technology that allows people to keep their hands on the wheel while staying focused on the road," a BMW spokeswoman told PCWorld. "People want to be connected, so we are allowing drivers to be connected in a safe manner." BMW's voice-to-text e-mail technology complements options that BMW already offers. With BMW's ConnectedDrive, for example, you can connect your Blackberry to the dashboard console with a Bluetooth connection and the audio system reads e-mail or text messages out loud as you drive. When the car is not in motion, it is possible to read the full texts of the emails from a Blackberry inbox on the car's dashboard screen. Despite his accolades for BMW's safety campaign, O'Donnell has long maintained in his blog that even hands-free calling is just as dangerous as holding your cell phone to your ear while talking and driving. He recently told the Wall Street Journal that "there's absolutely no reason for any person to download their Facebook into the car." However, safety experts generally agree that more studies are required to prove conclusively whether hand-free "infotainment" and communications technology for drivers is safe or not. The potential benefits are considerable--being able to use office apps in your car while driving can be a tremendous productivity booster, especially for drivers who have long commutes to make every day in their cars. Bluetooth headsets can reduce the dangers of distracted driving. But what remains abundantly clear is that texting and talking while holding a phone to your ear is extremely dangerous while driving. Indeed, U.S. Department of Transportation statistics show nearly 5500 people died in crashes involving distracted drivers in 2009, although the study did not indicate to what extent cell phone use and texting were the cause. Still, for whatever reason, many states have yet to ban either activity in the United States. By contrast, Western Europe has long since outlawed non-hands-free cell phone use and texting while driving. In the best-case scenario, the United States would legislate a nationwide ban on texting and handheld cell phone use while driving. And , I hope, it will stiffen penalties by imposing mandatory jail sentences on those who needlessly endanger the lives of others by engaging in these activities. Meanwhile, I still hold much faith in technology and believe that automakers just might be able to develop very useful in-car tech that is also safe to use. Bruce covers tech trends in the United States and Europe and can be reached through his Website at www.brucegain.com.